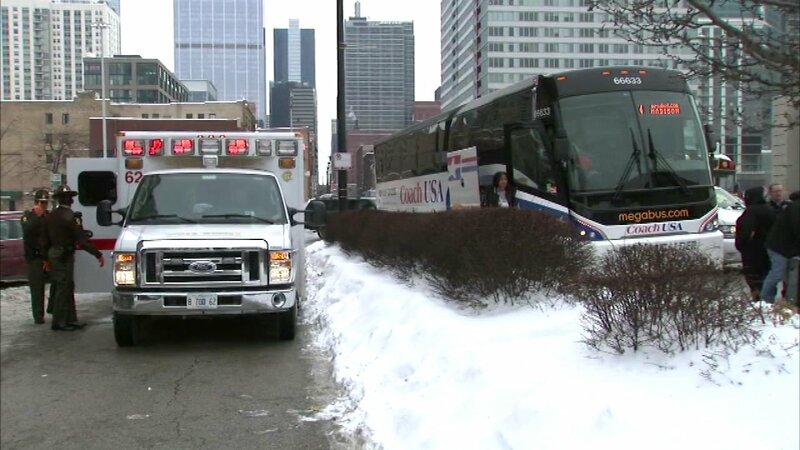 CHICAGO (WLS) -- A man was stabbed in the stomach Tuesday morning aboard a Megabus, which then stopped on Randolph Street near the Kennedy Expressway in Chicago's West Loop, police said. An incident occurred on southbound Interstate 90 in Chicago, said. Police were called to the scene at about 9:45 a.m.
Sean Hughes, a Megabus.com spokesman, said they are cooperating with police. Witnesses said the man attacked a woman on the bus, and then the woman stabbed him. The man was taken to Stroger Hospital in stable condition. The offender was taken into custody, according to Illinois State Police. The bus was coming from Minnesota, witnesses said.